Graph Database developer Neo Technology announced on Wednesday the company’s newest product, an authoritative book on graph database technology called “Graph Databases.” The book was written by Ian Robinson, Jim Webber and Emil Eifrem, and features simple, easy-to-use guides to graph database technology and how to implement it. The book is unique in that it features insider access to the world of graph databases, with rich detail from the real-world experiences of successful people and companies in the field. Neo Technology has one of the world’s leading graph databases on the market today, the Neo4j, so very few companies could put out a better book on the topic. “This book was written with the goal of providing everyone with the basic understanding of graph databases. The book gives unprecedented access to the power and flexibility of the graph and provides best practices for implementing graph database technology,” explained the company’s Emil Eifrem. Mitch Pronschinske of the software database news website, DZone, commented on why this book is coming out at exactly the right time, when graph database technology is rising in popularity. “The reason why graph databases are so successful and growing in popularity right now is because many businesses are evolving beyond atomic intelligence, and making huge competitive gains by leveraging connected intelligence. Graph databases are the best way to do this,” he said. Graph databases can be used to solve data management challenges that have become common for most businesses of late, including problems related to social networking, geospatial, recommendation engines, and master data management, to name a few. Another important aspect of business management that graph databases are uniquely designed to solve are the complex relationships that arise from competition between companies. Using graph database technology, these relationships can be leveraged to generate vital insight into competing companies, giving the business in question a competitive advantage. Relationships between a business and its customers are also key, and graph databases use telephone and data center information to analyze and help companies understand these important factors for their business’ success. Those businesses utilizing graph databases will certainly have a leg up on others in the future, as graph database technology solidifies its place in the business world, says Eifrem. 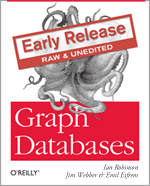 “Enjoy ‘Graph Databases’ and welcome to the wonderful world of graph databases!” he added. Read the full article.